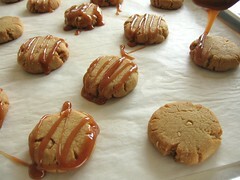 Cashew-Caramel Cookies - Do You Know The Muffin Man? Notes: These cookies are just like peanut butter cookies, except made with fresh ground cashew butter. I used unsalted roasted cashews so I threw in an extra half teaspoon of salt: not necessary as it turns out. I refrigerated the dough overnight so it would be easier to shape. They're flattened halfway through baking but I would make them even thinner next time so they cook faster. Texture was a little hard (slightly overbaked) but still tasty. Oh, I made the caramel from scratch; I can't believe a Martha Stewart recipe calls for melting cubes of soft caramel candy.